You might have heard that Random Acts is currently researching opportunities for a new development project following the completion of our work in Haiti this year. Currently, we’re encouraged by the scope of several different projects in a town in Nicaragua called San Juan Del Sur. We’re still a ways off from making an official announcement, but stay tuned — you’ll know as soon as we have any news to share! In the meantime, you might recall that late in 2012 we asked for your support to raise funds to purchase a school bus. That bus finally arrived in late 2013. Read on to find out more… and please enjoy this guest post from Random Acts’ Treasurer Tracy Liu. San Juan del Sur is a pretty beachside town in the south of Nicaragua that’s something of a paradise for surfers and budget travelers, but growing up and working there is a different story. A significant portion of the local population is illiterate and a decent job pays the equivalent of $1/hour. 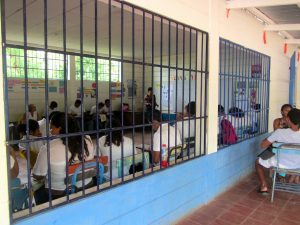 Many teens and adults, especially those from villages around San Juan del Sur, are uneducated because they must work to support their families and have neither time nor money to attend school. The Free High School was founded in 2002 to serve these teens and adults. It holds free classes every Saturday, providing life-changing opportunities to its students. The students’ drive to learn is so strong that many of them get up before dawn and walk for hours to catch a public bus which is extremely crowded and unreliable. For some, paying the bus fare means skipping lunch. Others are forced to drop out and pass up the only chance they might ever get to better their lives because they simply cannot afford to take the bus. Last year, the Free High School reached out to Random Acts with a request: a bus for its students. They had already received a $10,000 grant from another organization, but they needed about $15,000 more to purchase a bus. Random Acts matched the $10,000 grant and committed to raising the last $5,000. Our supporters came through for us and we were able to help the Free High School help its students. The bus they purchased began running in August of this year and serves 66 students who need it the most. I was able to visit the Free High School several months ago, and while there I met this young woman in the yellow shirt. She’s pregnant, but nevertheless she would get up at 2 am every Saturday to make the long trek to the public bus stop. Now that the Free High School has its own bus, she doesn’t have to anymore. We have already made a large and tangible difference to the lives of 66 students, and many more will benefit from the bus for years to come. This man, a student at the Free Technical School which is run by the same organization, stood up after I was introduced to the class to express his deep gratitude. Random Acts would like to pass on that gratitude to our supporters who made this possible. Thank you so very much!